With all the fancy juicers out on the market today, the good ole’ manual juicer doesn’t get much attention. They’ve been reduced to anonymity by all the hoopla over more popular models, but don’t mistake their silence for insignificance. Truth is, many manual juicers are good enough sit among the high rank of juicers. They do their job – juicing – and do it damn well. All without requiring electricity, much investment money, or lots of cleaning time. Did I mention that they’re also very pleasant (and silent) traveling companions? Of course, every type of juicer has its downsides and manual juicers are no exception. The main downside to manual juicers is the range of fruits and veggies that they can juice. For example, most of the manual juicers on the market are either citrus juicers or wheatgrass juicers. 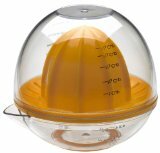 Citrus juicers can only juice various types of citrus fruits (and can’t juice the peels) so I only recommend them if you love your OJ and are looking for a dedicated citrus juicer. The great thing, though, about manual citrus juicers is that they really vary in price. You can opt for a simple but very functional "squeezer" type of manual juicer for less than $10 or you can go for a sleek, commercial-grade manual press citrus juicer, for which the price range is anywhere from $35.00 to $190.00! My recommendation? If you drink a lot of citrus juice and want a machine that's perfect for squeezing every last drop of orange or grapefruit - skip the $100+ citrus juicer, opt for a $20 - $30 range one and save the rest for a great, slow juicer that juices everything! See the best citrus juicers here! A huge advantage of manual wheatgrass juicers to citrus juicers is the wider variety of produce you can juice. A citrus juicer is a great addition to your kitchen - but I personally wouldn't be able to justify spending close to $200 on a citrus-only juicer unless I planned to only live off citrus juice for many, many years of my life (or ran a juice bar or restaurant). On the other hand, the best wheatgrass juicers do a great job of juicing wheatgrass (and other leafy greens) as well as several other kinds of produce - such as carrots, apples, and other hard produce. So you can make a whole lot of green juice as well as a huge variety of other juice recipes. Now that we know all about the various two types of manual juicers out there, we can move on to the best manual juicers on the market! 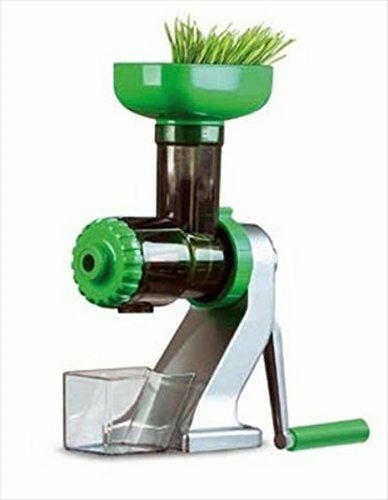 This is probably the best manual wheatgrass juicer on the market. At $99.00 on Amazon, it's twice the cost of the Lexen manual juicer (below), but it's still a fraction of the price of other juicers with similar functions. 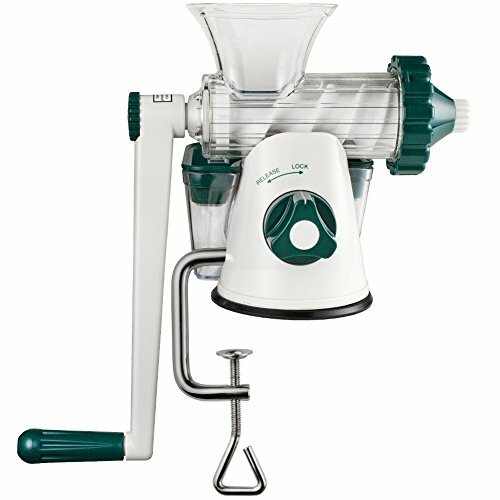 The Z-star manual juicer is unique in that it's basically a single auger, masticating type of juicer without the motor. That means you get the same process of extraction with no heat and better preservation of nutrients and enzymes. This juicer is a little easier to use than the manual juicer below because the size of the hopper (where you load the chopped produce) is a little bigger, but the ease of cranking is about the same. You can also juice a pretty wide variety of produce in the Z-star, such as leafy greens (obviously), as well as harder produce like carrots, apples, ginger and even softer fruits like tomatoes. This juicer is a great value - it's perfect for people who are just starting out juicing and want to test out the waters. The juice yield is high and the pulp is usually dry, so it does an excellent job of really extracting the juice from the produce. This is a great start-out juicer. The best part is that when you decide you want to move on to juicing a wider variety of produce and invest in a more advanced juicer, you can still use this one as a travel juicer!